The thrills never stop, 24-hours-a-day, and luck is riding on every turn of a card, roll of the dice, or pull of a slot machine. ...And it's all in the middle of the famous Las Vegas 'Strip'. With over 3,600 luxurious rooms and suites, the Flamingo lets you relax and float your cares away. Whether your trip is for business or pure pleasure, you'll find the Flamingo has the accommodations. With cool blue lagoons, pink flamingo fountains, and bubbling waterfalls, the Flamingo is a tropical paradise in the middle of the Las Vegas Strip. Catch some rays, splash down a cascading waterslide or relax with a cool drink by one of our inviting pools. 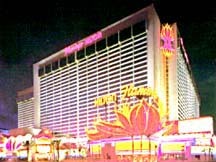 At the Flamingo you can relax, unwind, and float your cares away. For real 'heart pumping' fun, get in a few sets on one of the Flamingo's four lighted tennis courts or go for a workout in our health club. Get the kinks out with a massage or a sauna to get you ready for a night of excitement in the Flamingo's colorful casino. A world of wonderful dining adventure is yours at the Flamingo. Enjoy the all you can eat Paradise Garden buffet, The Alta Vista's authentic Italian taste, the finest steaks and chops at the Beef Baron, or our Peking Market. Plan your wedding at the Flamingo Hilton's beautiful Garden Wedding Chapel. The Flamingo can make your big day special with everything from photography to rice.